Like I said, krogith doesn't care about this age, straight from the horses mouth. How is he wasting our faith if he quit though? The grammatical errors in his post... make me laugh. How can anyone take anything Kroggie says seriously? Jesus. All I see is a house one member being silly, Krogith replying in kind, and a forum member having a quick jab as he has done in many other threads because he has history with h9. Skitty, I don't hold any grudges... I just never cared for krogith because of his holier than thou attitude. I would write everything i wrote here, to krogith himself... history is just that, history. Krogith was never a good leader. It's somewhat humorous, that house 9.... of all people is NOW interested in doing something lol. I played the first 150 days or so of this world, in scotland. Never once was scotland "united" like it is now... 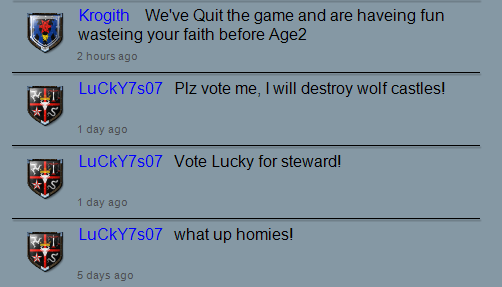 Most of the guys, with the exception of say, Krogiths faction... were playing farmville. I was in an alliance, with what is now the "braveheart warriors" which is essentially a merged faction of the bravehearts, and the caithness warriors.... who for the longest time, didn't do a * thing other than * over their allies, and land grab, so they could "hold" sherriff positions or keep lands for themselves. Everything from sutherland on north, is farmland. It didn't go unnoticed you know! BTW Scotland is a country and thus should be capitalised as should Braveheart Warriors, Caithness Warriors, Sutherland and North. If grammar is your thing you should now go punish yourself. To me it doesn't matter how someone writes or uses grammar as long as i can interpret or get at least get some sort of understanding of what they are trying to convey, and even the best literates make mistakes, you might even be able to pick some mistakes up in this very reply. Krogith is the last Great King of W5 to stand up against H1. lul... Last "great king"....... Does a "Great King" Only focus on himself while his house/factions mates, who have supported him, are being destroyed?